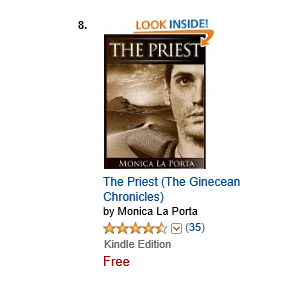 Eighteen days ago, I put The Priest for free on Smashwords. The title has been downloaded 119 times so far. Amazon hasn’t price matched yet, but the book is available both on Nook and iTunes for free. From what I understood, I am nowhere near the number of downloads other titles seem to gather overnight. Said so, I’ll try to get Amazon on board and see if it makes any difference. If that doesn’t work, I’ll find something else. Meanwhile, I’m writing the next book. And thinking positive thoughts.